It’s a phrase we’ve all heard time and time again, but when you really think about it, it’s pretty amazing how much a good laugh can help when things aren’t going well. When you have a tough day at the office and your coworker is willing to make a goof of himself to put a smile on your face, it can go a long way towards brightening your day. 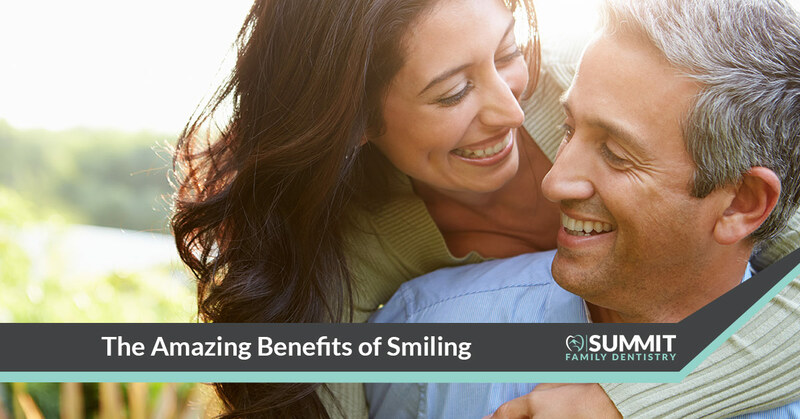 Did you know that there are actually a number of genuine benefits from smiling throughout your day? What better reason to see a dentist, right? In today’s blog, we’ll take a deeper look at a few of these benefits. Let’s get started, shall we? Multiple studies have shown that the simple act of smiling can help to reinforce to your brain that you’re feeling okay. Whether you’re happy or not, turning your frown upside down–literally–is a trick that you can use to positive effect. It’s like that old saying, “fake it until you make it.” In this case the saying is “smile until you are in a better mood.” No, it doesn’t have quite the same ring to it, but if it can help to turn your mood around, it’s worth keeping in mind. If you’re having a rough go of things, make it a point to try to smile, because it just might be what you need to start turning things around. Taking a quick break to have a silly chat with coworkers can actually help to turn things around and up your productivity at work. Of course if your supervisor has a problem with it, just tell him or her that it’s for science. When you’re feeling overwhelmed, the best thing you can do is to take a deep breath, try to relax, and do your best to think of something that puts a smile on your face. Seek out a few stand-up routines on YouTube, bookmark a joke website, or turn to a coworker who knows the right thing to say. At the end of the day, your stress levels will plummet and you’ll be feeling much less stressed than if you tried to soldier through it. Rather than making an effort to grin and bear it, you can grin and feel a bit better; sounds pretty good to us! Perhaps best of all, smiling at someone can totally change their day for the better. An article on Psychology Today highlights it perfectly when its author, Sarah Stevenson, describes a situation where she was having a bad day. All it takes is a nice server who smiles at her to turn things around. Her conclusion? “It turns out that when I smile, the world smiles back.” When you smile at someone, it might be exactly what they need to help turn their day around. The article goes on to note that when you smile, your brain releases serotonin which can help to be an antidepressant, mentioning that “many of today’s pharmaceutical antidepressants also influence the levels of serotonin in your brain, but with a smile, you again don’t have to worry about negative side effects – and you don’t need a prescription from your doctor.” Sounds like a win/win to us! At Summit Family Dentistry in Denver, North Carolina, our goal is to ensure that your smile is happy and healthy because we know how many great benefits there are to smiling. Regardless of your dental background, you can count on us to go above and beyond to provide you with the treatment you need for teeth that look and feel great, giving you the confidence to crack a huge smile as you work your way through the day. The previously mentioned article also highlights a Swedish study in which people were shown pictures of others who were smiling and asked them to frown. The results were that people just couldn’t do it the vast majority of the time and notes that if you smile at someone, “it’s likely they can’t help but smile back” and that “if they don’t, they’re making a conscious effort not to.” Wouldn’t you love to be the person who goes around spreading smiles? We sure would! If you’re ready for a checkup, we’d be glad to see you. Feel free to take a peek around to learn what makes us different or get to know our dentist and the rest of our team. Give us a call if you have any questions, of course, or you can also schedule an appointment. Whatever the reason for your visit, you can know that you’re in good hands when you choose to see the crew at Summit Family Dentistry. We look forward to hearing from you!